What Is a Verification of Property Condition? A reader asks: "We just finished doing our final walk-through of a home we are supposed to close on next week. During our inspection, we discovered some of the doors that were on the bedrooms are now stored in the garage. Do we have a right to make the seller put them back? Our agent gave us a verification of property condition to sign. We wrote on it that we want the doors installed. We are worried that the sellers might be planning to run off with the doors. Will a seller make repairs as noted in the verification of property condition?" Answer: Just a quick note up front: Initially, this was not an email that we could respond to because your home buying guide is a REALTOR®. As a fellow REALTOR®, she is prohibited from interfering in another REALTOR's® transaction! Therefore, the only correct answer to this was to ask your agent what you should do about the verification of property condition. However, now that this transaction is no longer an active situation, I am addressing the question in hopes of offering an explanation to other buyers. First, understand that a verification of property condition is not a tool for negotiations. A verification of property (VOP) condition is used to absolve a real estate agent from liability after the final walk-through, as well as prove that the buyer had an opportunity to look at the property one more time. A standard C.A.R. form used in the state of California says the verification of property condition is not a contingency of the purchase contract. This means there are no terms to satisfy prior to closing. The VOP does not alter the seller's contractual obligations to the buyers. 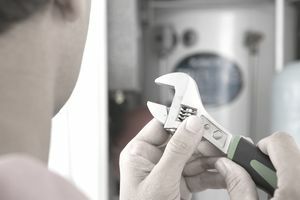 For example, if a seller agreed to fix a water heater, the seller is still obligated to fix the water heater, even if the water heater is not yet repaired. Most purchase contracts contain some type of verbiage that says the seller promises to deliver the home at closing in the same condition as the date of the purchase contract. Purchase contracts also often allow for a final walk-through to be performed within a certain number of days prior to closing. A buyer generally has the option of waiving the final walk-through inspection or conducting the walk-through. It is never recommended that a buyer waive this inspection. Why? Because if something horrible had happened and you allowed the escrow to close before resolving it, your main recourse against the seller could involve going to court. A number of years ago, I sold a condo to a buyer from Saudi Arabia. She did not want to do the final walk-through, and she signed a waiver of final inspection. I had asked if her daughter could do the walk-through for her, but she declined. A few days after closing, I met the daughter at the condo to give her the keys. When we opened the door, we discovered two big problems. The first problem was somebody had turned the A/C down very low, and the fan was on full blast. The place was a freezing, arctic temperature. It was so cold that the A/C unit had frozen. A block of ice had been melting, and the carpeting was soaked. Second, there was a strong cat odor. We had not noticed a cat in residence earlier. But the odor when we opened the door was unavoidable. Cat urine has a distinct smell, and it is very hard to get rid of it. Had this buyer conducted her final walk-through and noted the items on a verification of property condition, we could have issued a request for repair or asked for a concession prior to closing. But at this point, it was too late to hold up the closing because it had closed. A verification of property condition is not the form to use to stop the escrow from closing. To prevent a closing, a buyer would need to sign a specific request. A buyer will never have as much leverage after closing as a buyer will possess prior to closing. I should also point that the buyer who wrote to ask about the doors in the garage was probably a first-time home buyer, and perhaps a very nervous first-time home buyer at that. In most real estate transactions, it is unusual for a seller to remove fixtures without permission or authorization. My guess is the doors in the garage had probably always been in the garage, and the buyers did not notice them during the initial home inspection.